Arturo Di Modica probably never in a million years would have expected such a macabre addition to his sculpture, the Bowling Green Bull, and neither did Homicide Detective-Specialist, Lou Martelli. The cobbled bricks below the sculpture caught the droplets of blood dripping from the severed head of an unknown man who later proved to be that of John Williamson, a senior financial analyst from Bartlett, Cline, and Stephenson. The bull’s left horn held the head aloft so all approaching the Financial District might see him at sunrise, the last sunrise Williamson’s unseeing eyes would ever behold. Martelli, who approached the scene, was no stranger to death and destruction and, as an Iraq vet, was able to keep his emotions in check. His prosthetic leg was testament to that fact, but another seasoned vet of a different sort of war altogether was already on the scene. For Michael Antonetti, Deputy Coroner, it may have been just the start of another day, but even he had to admit this was a weird case. Bagging evidence of this sort was, at the very least, distasteful. 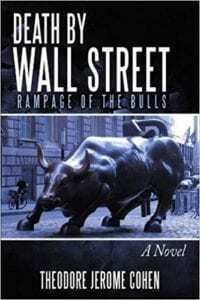 On one level it was quite apropos as Wall Street, the ‘Street,’ was “home to the oligarchs who raped and pillaged Main Street while awarding themselves outrageous salaries and stock options, their ‘rewards’ for having cheated, swindled, and defrauded the Middle Class of its savings and retirement funds.” (pg. 3) Antonelli pointed out a possible friend of the vic, who was adding some of his own bodily fluids to the streets of Manhattan, and soon the wheels of Martelli’s mind would begin to turn when he began to interview Steve Jacobs. Blood and vomit were no way to start anyone’s day, but it was what he’d signed up for. Lou, as most people called him, listened as hints of something more insidious were interwoven with Jacobs’ tale as were the expected tidbits that gave a glimpse into the personality of that “arrogant sonofabitch,” who was now history. Jacobs began to spill a tale of stock manipulation in the biotech field that if it were true would not only have sent stocks tumbling, but would have impacted the lives of millions. HerDeciMax was a drug in the forefront to cure breast cancer, but that sonofabitch squelched the stock, the monies from which would have completed the medical staging. “You can make more money betting against a biotech company succeeding than on the possibility it will bring a product to market.” (pg. 14) Jacobs gave Lou more than a running start in this case, but soon there were more heads rolling. Dr. Paul K. Broussard, oncologist and a consultant to the National Cancer Institute, who suffered the same fate as Williamson, was found “in the lap of Robert Aiken’s stature Future” in DC. The MO was the same and the Capitol Hill Police probably had someone puking up a storm down there. They weren’t NYC cops and weren’t used to the oddball stuff. Missy Dugan, a Principal IT Specialist had given him two numbers from a license plate from Iowa. A ‘2’ and a lucky ‘7’ weren’t much to go on. Someone was onto the salty, seasoned detective. “I need the e-mail server cleansed of all e-mails sent by, or to, John Williamson. Delete them! Make him disappear. Erase any sign that the man ever existed ….” (pg. 80) Why would Wall Street futz with the lives of the innocent? Was someone trying to exact revenge for the Berranger biotech fiasco? Would Lou be able to find the perp before another head rolled? A simple, childish connect the dots exercise would change this fictional treatise on the seedy Wall Street manipulation of critical biotech stock into an explosive exposé. Naturally it would be an exposé that would reveal the unethical, murderous practices carried out beneath our very noses while the SEC and the FDA look the other way. Seldom do we find ourselves rooting for the perpetrator of such heinous murders, yet anyone reading this novel will quickly discover some modicum of sympathy for him. This is an excellent police procedural, yet I quickly sensed that the intent of the author was not to introduce a series with Lou Martelli at the forefront, but rather to use this book as a vehicle for his ‘theory’ of devious dealings in the Wall Street Financial District. The delicate balance between churning out information on the role of Wall Street and its dealings with the biotechnology industry and the presentation of a murder mystery was quite well done. This is the type of work that actually leaves one with a few more unanswered mysteries that even Lou Martelli couldn’t solve. Have you or any of your loved ones been a victim of Wall Street? Perhaps you’ll never know. Quill says: If you want the real scoop on the insidious dealings of Wall Street vs. the biotech industry, you need only follow Detective Lou Martelli as he unravels the threads of death and injustice as only a NYC cop can do!